Some of the best Rieslings I’ve ever had were tasted last week! I say that with the disclaimer that I’ve had Riesling from Washington, Oregon, Michigan, and a few from Germany. I’m not a Riesling authority, but from what I know about wine, from what I understand of my palate, from what I tasted, the six New York Finger Lakes Rieslings presented during #FLXwine were top notch in consistency, quality, clarity, balance, and flavor! What I find odd is that when I traveled 2800 miles to the largest city in the US, no one had Finger Lakes wine on the menu. None of the three wine bars we visited showcased their state. These wines had to travel 2800 miles to me. Because of our nations screwed up distribution system, I’ll be hard pressed to ever see any here in Spokane, but trust me, I’ll ask around! The #FLXwine tasting was organized by New York champions Lenn Thompson and Evan Dawson. According to stats from WTHashtag.com there were over 600 tweets by 80+ people. I was honored to be one of the few representing from the West Coast. The wines were graciously provided by six Finger Lakes region wineries. 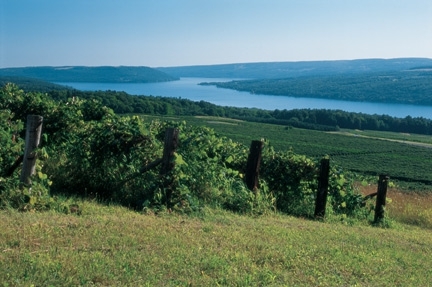 With over 100 wineries sandwiched between Syracuse and Rochester, Finger Lakes is putting New York on the map for fine wine. Visit www.fingerlakes.org for all kinds of info on the area. Stay connected to www.newyorkcorkreport.com winery stories, wine tastings and info on all of New York’s wine regions. The video is a quick snapshot of the tasting. You’ll get my initial reactions to the wine including color, aroma and flavor. I’ve also included my tasting notes and score for each wine below. I highly encourage you to seek out the ones that would fit your likes. Each of the wines was on the dry to medium dry side. The Sniff: Slightly shy nose that came out to play as the wine warmed up closer to room temperature. Hints of petrol and minerals on the nose with a subtle citrus note. The Sip: The palate is intriguing and complex. Quite a bit happening from the range of a palate puckering lemon zest to wet stone and even a touch of lemonade in a can (with the steely aspects). The acidity is strong but leaves me feeling slightly off balance. Finish trails off leaving my mouth feeling tart. The Score: At $30 the wine is a good complex Riesling that would most likely show well in another 3-4 years. I’m very interested to see how all the flavor components will mature and blend together over time. I score this wine a 3+ out of 5 but strongly encourage a food pairing if drinking now. The Swirl: Beautiful light yellow honey color, very clean and clear. The Sniff: Imagine you’re walking through a clothesline filled with freshly washed linen sheets blowing in the breeze. The fabric softener used had a hint of lemon in it. Throw in some river rock aroma and you have the nose of this wine. The Sip: A very nice balanced mix of soft grapefruit, pear, apple, and a hint of lemon zest. The acidity is perfectly balanced and leaves the mouth feeling refreshed and not tart. The Score: At $16 (incorrectly listed in the video), this wine delivers on both the quality and value fronts. A solid effort with a score of 4 out of 5. I highly recommend this wine for summer sipping or pairing with shellfish, halibut, lobster, crab, spicy fair, etc. The Swirl: Lighter in color than traditional Riesling. Reminiscent of water with a hint of lemon coloring. Clean and crisp! The Sniff: Soft aromas on the nose with beautiful apples, orange blossoms and linen. Very floral. The Sip: Nice complexity as the wine is starting to show the age ability that Rieslings can demonstrate. A great soft feel in the mouth with a hint of sweetness on the tip of the tongue that quickly jumps to a wonderful expression of green tea, apples and almonds. The finish showcases a perfectly balanced acidity with hints of orange and herbs. The Score: This wine has me transfixed on what Riesling can be in New York. A highlight of my tasting line-up, the wine scores 4 out of 5 ($26). If you can find this wine at under $20 buy a case. The Sniff: Ouch, I just got smacked in the nose with peaches. After wiping the peach juice away more undertones of sweet pears and slight steel. The Sip: More fruit forward and presents itself being slightly more sweet but still on the dry side. Feels more full bodied in the mouth. A good flavor of passion fruit and minerality with medium acidity. Simple, straight forward wine. The Sniff: Distinct petrol and a hint of mint. The sniff presented a slight tinge on the upper register of my nose. Not sure what caused it, possible alcohol or sulfur. The Sip: A fantastic display of character on this wine. Wonderful flavors of honey, granola, and peach make for a very enjoyable experience. A touch of sweetness balanced with good acidity make this an elegant mouth feel that begs for more. The Score: At only $15, another fantastic display of quality and value from Finger Lakes. Easily the best Riesling I’ve had from the region scoring a 4+ out of 5. The Sip: A crowd favorite due to the moderate sweetness. Fantastic sipping wine that has nice flavors of peach and a hint of spicy white pepper and citrus. The acidity provides a nice balance to the sweetness and is overall a solid medium dry wine for those that want a hint of sweet. The Score: Balance is the name of the game here. What the wine lacks in aroma, it makes up for in flavor and balance. A fantastic deck wine to cool off with on a hot New York night. I score this wine 3+ out of 5 (price not known). nectarwine: I’ve got to say, I’m completely and totally impressed with #flxwine – You popped my NY cherry tonight and I shall never forget you! Below are two bonus videos that I recorded with Finger Lakes wine and my guitar. Each video is about a minute in length…enjoy! too bad distribution is really bad. Granted, I don’t know if these are all small production folks who want to sell at a retail price to winery visitors (and direct-ship club members) rather than sell at wholesale profits to a distributor. Being the 3rd/4th largest producer of wine in the union, I’d have to think there is a significant amount of New York wine that should be more widespread, though. Some of these wineries had some pretty significant quantity production. Profit is a big motivator. When a winery can be fairly successful at self distributing up to 5k cases, whey would they need to engage a distributor. Love the musical interpretations of the wines. Very creative! I agree that these were great wines across the board, and am glad the Finger Lakes Rieslings have made a good impression. Thanks so much for participating in the TTL, and for a great post on the event. We hope you can come taste the wines in their natural habitat soon. Great reviews, but I must confess – I skipped down to the bottom to see the guitar playing…and you ROCK bro! Cover of Wine Spectator notwithstading, these great wines don’t get enough attention; thanks for helping to remedy that. But ouf! How could you miss trying any of Dr. Konstantine Frank’s offerings? More than one style, all consistently good in my experience, reasonably (or more than reasonably) priced, and distinctively Finger Lakes. Frank was the first to plant viniferas in the area and worked long and hard to convince others of the same. May his legacy never die!